"Sampath Speaking" - the thoughts of an Insurer from Thiruvallikkeni: Bay of Plenty – Tauranga and MV Rena running aground ! Bay of Plenty – Tauranga and MV Rena running aground ! Ships sailing would never make news ! .... but some accident happening to them would !! Perhaps One might not have read much about the Bay of Plenty, a region in the North Island of New Zealand situated around the body of water of the same name. The bay was named by James Cook after he noticed the abundant food supplies at several Māori villages. Going by 2006 Census, the Bay had an estimated resident population of 257,379, making it the fifth-most populous region in New Zealand. Tauranga is the most populous city in the Bay of Plenty region, in the North Islandof New Zealand. The city lies in the north-western corner of the Bay of Plenty, on the south-eastern edge of Tauranga Harbour. 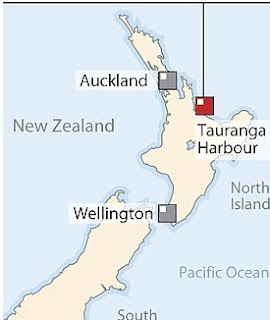 The Port of Tauranga is New Zealand's largest port in terms of gross export tonnage. This place is in news now !! 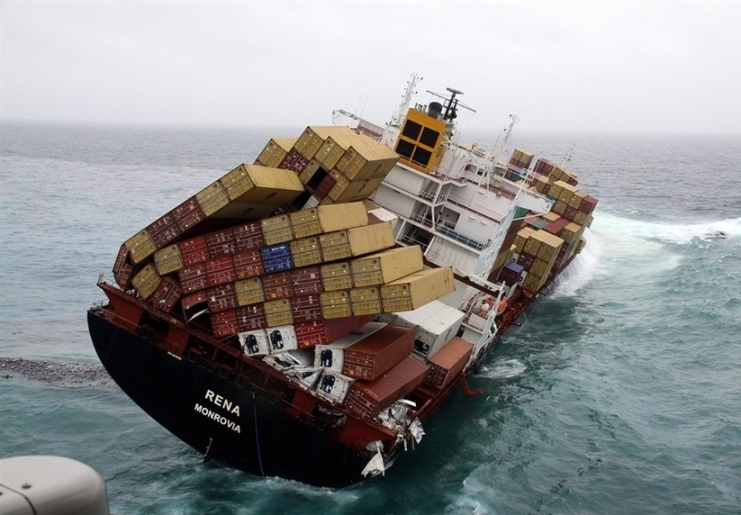 New Zealand is keenly following the news about MV Rena which ran aground on the reef on 5th October 2011. MV Rena is a Cargo ship of 235M length with Liberia flag. Its IMO No. was 8806802 with call sign A8XJ7. More than the damages to the vessels, the possible damages to the marine environ and wildlife is threatening. The container vessel is listing and waves rocking the vessel is slowly breaking it up. A total of 1386 containers were on board the ship and over 88 containers reportedly have fallen into the sea and some have been washed ashore. Some of the containers that have fallen overboard contain dangerous chemicals. Reportedly, there are four containers of ferrosilicon, a solid matter that can give off hydrogen and cause a fire risk if it comes into contact with water. There are close to 100 containers carrying dairy products also. The scene of action is Astrolabe Reef near Motiti Island, off the Bay of Plenty coast in New Zealand. The reef, which breaks the water surface at low tide, is a renowned scuba diving spot. The reef was named by Jules Dumont d'Urville after his ship Astrolabe, when it nearly ran aground there on 16 February 1827. Immediately after the running aground of the vessel, oil leaks were detected and Salvors were contracted. Svitzer moved in, began pumping oil to a bunker barge, but this was hampered by bad weather. Meanwhile the crew were evacuated. Following the oil slick, the Mount Maunganui Beach was observed to be black with oil with black oily waves pumping shore. The beach at Maketu Point was closed to the public. 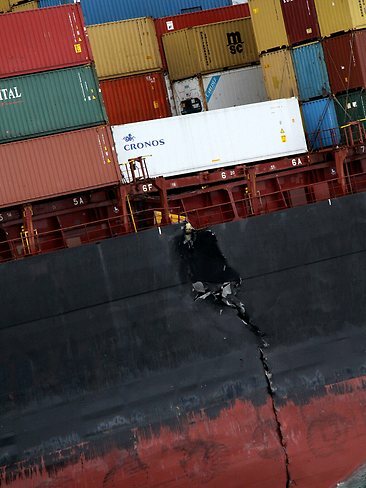 Six vessels had been mobilised to clean up the mess of battered containers, timber, cardboard, wrapping and other debris bobbing in the water amid a thick, purplish slick stretching kilometres southward from the ship. Bay of Plenty businesses could receive compensation packages from the Government in the wake of the Rena oil spill. The provisional clean-up cost is reportedly estimated at $12.1 million. Despite the Government's claims that the situation would take some time to resolve, a small group of protesters marched down Wellington's Lambton Quay today to protest what it says is government slowness to act. It has had its waves felt at the Govt level. Prime Minister John Key travelled to the area and told that stress fractures have been identified on the ship, and that its disintegration cannot be ruled out. The Environment Minister was quoted as saying that some 1300 tons of heavy oil remain on the vessel and every effort is being made to contain it. He said the oil posed a far bigger environmental risk than anything else the vessel is carrying. Now 10 days after the agrounding, there are allegations that the vessel which has caused New Zealand's worst maritime pollution disaster ran aground because the captain was taking a short cut. Compared to oil slicks like the one involving Exxon Valdez which ran aground in 1989 in Alaska dumped 37,000 tonnes of oil into Prince William Sound, this is small but still anger is mounting in New Zealand over the fuel leak, with popular beaches on the North Island's east coast coated in oil and off-limits to the public, and more than 1,000 dead and oil-soaked birds recovered. This is considered a disaster because of the pristine nature of the Bay which contains marine reserves and wetlands and teems with wildlife including whales, dolphins, penguins, seals and rare sea birds. Reportedly, the six Filipino crew members who are still in New Zealand are being kept at an undisclosed location amid fears for their safety. The ship's captain and the officer on navigational watch when the ship ran aground have been charged with operating a vessel in a manner causing unnecessary danger or risk. The charge carries a maximum penalty of one year in jail. The salvage act was hindered by rough seas but recently the salvors were able to board the vessel checking the systems. The ship reportedly was safe to work from and a barge was moored in vicinity to receive oil from the ship. The movement of the vessel could also be arrested as the pumping operations could be conducted at this stage. But a vertical crack had appeared on the vessel and it was breaking down boring the brunt of the sea waves lashing it. The assistance of industrial chemists were also sought for monitoring the fumes coming from the oil. After the Emperor Penguin ‘Happy Feet’ – Newzealand is offering assistance to some more penguins, this time by cleaning the feathers of those caught in the oil slick. Rescue teams were searching the shore for more wildlife affected by the oil. The ship’s Greek owners, Costamare Shipping, have apologised for the accident and have promised to fully cooperate with the investigation into how the Rena managed to hit the well-charted reef. What is in the containers?